The West Colvin Street Road Reconstruction Project exemplifies the continued partnership between the City of Syracuse and Onondaga County through the Save the Rain Program. 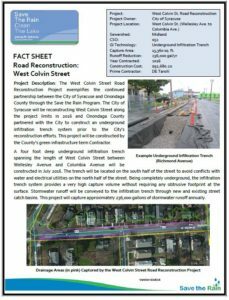 The City of Syracuse was reconstructing West Colvin Street along the project limits in 2016 and Onondaga County partnered with the City to construct an underground infiltration trench system prior to the City’s reconstruction efforts. This project was constructed by the County’s Green Infrastructure Term Contractor. 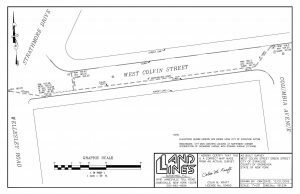 A four and a half foot deep underground infiltration trench spanning the length of West Colvin Street between Wellesley Avenue and Columbia Avenue was constructed in July 2016. The trench is located on the south half of the street to avoid conflicts with water and electrical utilities on the north half. As it is completely underground, the infiltration trench system provides a very high capture volume without requiring an obtrusive footprint at the surface. Stormwater runoff is conveyed to the infiltration trench via existing and new street catch basins. In total, this project manages runoff from 13,360 square feet of impervious drainage area, resulting in approximately 236,000 gallons of stormwater runoff captured annually.